One of Inprint’s most innovative and highly popular programs is the Inprint Poetry Buskers program. A collective of talented local writers and graduate students and alumni from the University of Houston Creative Writing Program, the Inprint Poetry Buskers write free poems on requested themes for attendees at festivals and special events throughout the city. 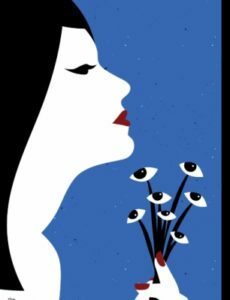 The program demystifies poetry for the public and makes it more accessible, in a joyous and interactive way. 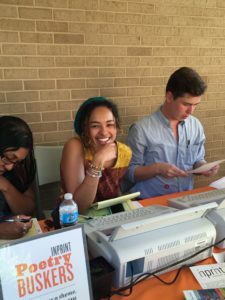 Poet, Inprint blogger, and University of Houston Creative Writing Program graduate student Erika Jo Brown helped her undergraduate students appreciate the power of serving as an Inprint Poetry Busker. A few weeks ago, intrepid students in my Introduction to Creative Writing Poetry class at the University of Houston felt the thrill and caliber of being an Inprint Poetry Busker at the Red Block Bash, coordinated by the Blaffer Student Association. They busily worked while emcees freestyled and drawing students sketched caricatures in the arts district courtyard.